Research Branch, NC Office of Archives and History, 2009. 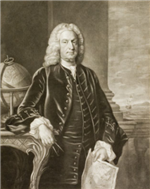 In 1758 the General Assembly decided that Johnston County should be divided and that the newly formed county would be known as Dobbs, in honor of Arthur Dobbs, the Royal Governor of the colony of North Carolina. Close to the center of the new county, the old Johnston county seat at Walnut Creek became the seat of Dobbs, with the courthouse and its records remaining in tact. Johnston County was given a new seat and courthouse at Hinton’s Quarter, closer to the center of the new smaller county. In 1779 Dobbs County was divided and the county seat was moved to Kingston (modern Kinston) where Richard Caswell, then Governor of the new state of North Carolina, owned property. Walnut Creek became the seat of the new county of Wayne, formed from the western half of Dobbs. The records in the old courthouse, however, moved with the Dobbs County records to Kingston. 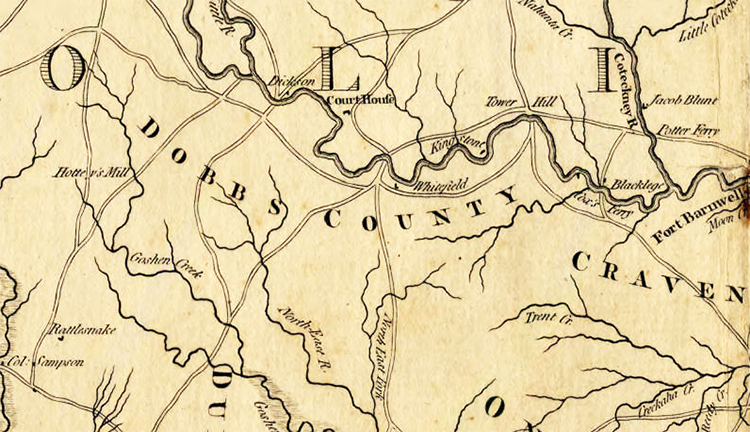 Dobbs County, the name a constant reminder of the old regime, was abolished in 1791 and two new counties were formed. They were Lenoir, named for William Lenoir, speaker of the state senate, and Glasgow, named for James Glasgow, Secretary of State. When Glasgow was found guilty of land fraud, the name of that county was changed to Greene, in honor of Revolutionary War hero General Nathanael Greene.